The commercial and economic centre town of Ramat Gan near Tel Aviv will soon boast a new landmark structure. Set to top out at 167 m, the Champion Tower will be one of the tallest office buildings in Israel’s metropolitan region of Gusch Dan. Doka Israel is supplying this complex development with a comprehensive formwork solution consisting of Automatic climbing formwork SKE50 plus and Xclimb 60, Load-bearing tower Staxo and other items from the Doka ‘construction kit’. The 25 m long and 16 m wide structure core is being constructed entirely in CIP concrete. When the project was planned, the forming operations were divided into three separate zones so as to ensure swift construction progress with six-day cycle times. 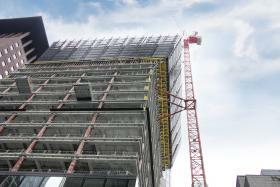 The crane-jumped MF240 formwork system is ensuring great flexibility in the work on the outside walls. The inside of the intricately shaped structure core is characterised by a large number of small shafts and spaces. To meet the special requirements that this entails, the experts from Doka Israel and the Automatic Climbing Technology Competence Centre delivered a custom formwork solution. The backbone of this solution is the high-performing Automatic climbing formwork SKE50, with vertical shaft profiles for attaching a horizontal line of steel girders from which the formwork is then suspended. The advantage of this is that the whole shaft formwork is attached to just one wall, meaning that it can be climbed up to the next casting section quickly and automatically. In addition, seven Doka shaft platforms are in use here for forming the inside-shafts. Used with Framax stripping corners I, these can be formed up and stripped out in a very short time, and lifted to the next casting section, complete with the shaft formwork, in just one crane cycle. All in all, Doka is supplying 1600 m² of wall formwork for the structure core of the Champion Tower, with Framed formwork Frami Xlife providing an economical solution in the narrow shafts and Large-area formwork Top 50 ensuring cost-effective working in all other areas. Considerations of cost-efficiency were also central to the search for a suitable formwork system for the concrete beams. High load capacity and safety were assured by the Load-bearing tower Staxo system in conjunction with Doka ‘H20 top’ beams and 3-SO formwork sheets and steel walings WS10. Safety also played a deciding role in the choice of formwork supplier. Here Doka scored convincingly with its self-climbing Protection screen Xclimb 60. Behind the shelter of a 1550 m² windshield mounted to 44 Xclimb 60 brackets, work can proceed protected from the weather and in great safety. In addition, the two integrable loading platforms provide a safe and easy way to reposition formwork or tools. “The Doka Formwork Experts convinced us with the high problem-solving capability they applied to all the issues involved – especially the geometry of the structure core. With Doka we feel that we’re in completely safe hands and are being very well looked after”, sums up Nir Bechor. Thank you for your interest - Intricately designed core shaping up fast with Doka. Thank you very much for your interest - Intricately designed core shaping up fast with Doka.